At McNeil Industrial we, through our extensive knowledge and experience, provide high-quality industrial refrigeration services for both design, installation, and repairs throughout North America. We have professional aptitude and resources to help you with all of your ammonia cooling system requirements. Our team implements industrial refrigeration design along with reliable installation procedures to ensure you receive a dependable, high-performing, and cost-effective refrigeration solution. We implement designs that are intended to produce energy efficient operation and reliability that limits the need for maintenance. We examine the various stages of the systems we design and install to identify potential opportunities for cost reductions while ensuring the performance of the systems are maintained. We work diligently to meet the specific requirements of our individual customers when it comes to the industrial refrigeration services we provide. Our engineering professionals are committed to ensuring your system operates as you need it to for the long-term. We always search for innovative ways to achieve the most optimum results possible for your ammonia cooling system. If you are in the market to change out your present industrial refrigeration system for an updated system that operates with a higher level of efficiency, we have options available for you. Our team of designers and engineers can handle your entire project to achieve a cost-efficient result on your behalf. 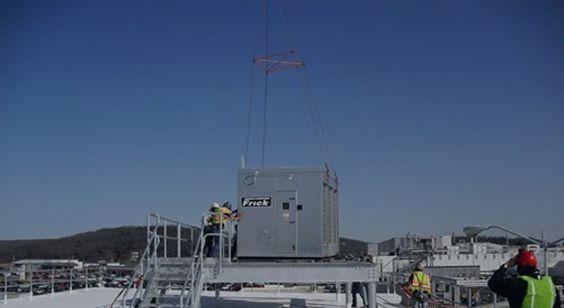 At McNeil Industrial, we are your premier provider of highly economical and low maintenance industrial ammonia cooling systems that are applicable for use in a number of different industry applications. We have completed numerous refrigeration systems for clients over the years. Due to our extensive experience and impressive portfolio, we have the capability and credibility to tackle a variety of industrial refrigeration design issues on your behalf. We utilized cost-efficient design combined with state-of-the-art technology to meet your specific system requirements. If you are looking for reliable industrial refrigeration services provider, we have you covered at McNeil Industrial. To find out more about how we can serve you, call our team today at 800.728.6160 or use our contact form to send us a message.